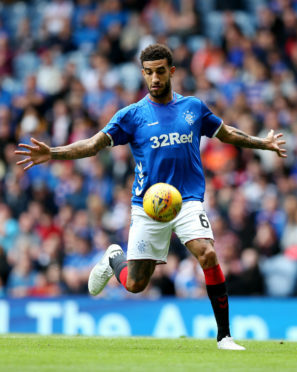 Rangers centre-back Connor Goldson. Picture: Robert Perry/PA Wire. Rangers defender Connor Goldson has told Aberdeen they should have expected celebrations from the away dressing room after plastering photographs of their recent Hampden win along the Pittodrie corridors. Goldson claims the Rangers players were fired up by seeing about 20 photographs from the Dons’ Betfred Cup semi-final win. Rangers had not beaten Aberdeen in three previous meetings this season before winning 4-2 on Wednesday. Witnesses in the tunnel claimed Dons boss Derek McInnes banged on the dressing room door to ask the visiting players to tone down their celebrations before exchanging words with Rangers manager Steven Gerrard. Goldson said: “I didn’t see him pop his head in, I don’t think he came into our changing room. But they celebrated massively when they got a point against us earlier in the season. “Walking into their stadium the other day, they put pictures from the semi-final on the wall. Goldson claims the photo display was striking. “We all noticed it walking in,” the former Brighton player said. “You couldn’t not notice it. They put them up in about 20 picture frames walking down the corridor. “It was noticed, it was spoken about and it just gave us more motivation going into the game. “It’s obviously motivating. I don’t know what effect they thought it would have, whether they thought it would make us think about the past and be down. But we all saw them as soon as we walked in, and we had a point to prove. Aberdeen assistant manager Tony Docherty also denied reports McInnes had burst into the Rangers dressing room. “That was a lot of hullabaloo about nothing,” Docherty said. The game was Goldson’s first of the year after doing only light training following an ankle injury and he was hailed for his commitment by Gerrard. And the centre-back is hoping to go again at Kilmarnock in the William Hill Scottish Cup fifth round on Saturday. The 26-year-old said: “Obviously I was out for a quite a while and I knew I wanted to make that game, and luckily enough the physios and the doctor got me back available for it. I was just happy to be selected and to get three points. “The legs are still recovering but the ankle reacted well after the game. “I was disappointed to miss a few games, I thought I would be back earlier after the Celtic game but it wasn’t to be. The ankle reacted a few times.